The new Yamaha F200 is not only the world’s lightest 200hp 4-stroke outboard, it also boasts the best power-to-weight ratio of any 200hp 4-stroke. Weighing in at just 227kg, the new 4-cylinder F200 features a brand new powerful 2.8-litre double overhead camshaft engine, variable camshaft timing and Yamaha’s patented Shift Dampener System (SDS), previously found only on Yamaha’s 4.2L V6 range. Fitting perfectly between Yamaha’s popular F150A and the company’s innovative 4.2 litre V6 engines, the new F200 weighs an astonishing 56 kg less than the V6 F200 and is just a mere 6 kg more than Yamaha’s super-powerful two-stroke 200hp HPDI. Even more impressively, the new F200 actually weighs 1 kg less than the F150A! Yamaha Motor New Zealand’s Greg Fenwick says the new F200, due here in February, will be ideal for new owners of 6-metre GRP trailer boats and those looking to repower. “Many 6-metre GRP boats in New Zealand have been powered with our extremely popular F150A,” he says. “However, although the 150 does a superb job in most situations, there are always those who want more power, either to go faster or to carry more load. While the V6 200hp four strokes delivered that extra power, they were also quite a bit heavier. Yamaha’s 2.8-litre, 16-valve DOHC powerhead, sophisticated valve train design and Variable Camshaft Timing System combine to ensure market-leadingly quick, responsive acceleration and a super-strong mid-range punch. The clever new F200 is also the first 4-cylinder, 4-stroke outboard to incorporate Yamaha’s revolutionary Shift Dampener System (SDS). Using a patented splined rubber hub to absorb the force created when an outboard is shifted into gear, SDS ensures smooth, virtually silent gear changes, giving greater durability and a more pleasant experience. Combined with a powerful 50-amp alternator (delivering 13 percent more charging power than even Yamaha’s V6 F200) and Yamaha’s Variable Trolling RPM Switch (VTS) the new 4-cylinder F200 is the perfect engine for everything Kiwis do on the water: fishing, diving, water-skiing and wake-boarding and simply cruising our beautiful seas and lakes. The first F200F models, with Yamaha’s smooth, reliable mechanical shift systems, are due in New Zealand in early 2013. They will be followed, a couple of months later, by the even more impressive F200G models. These will feature Yamaha’s renowned digital electronic control and be able to connect to Yamaha’s High Definition Displays. These fully customisable displays are the best user interfaces in the outboard industry, allowing the skipper to select both the preferred display style and the perfect combination of information. 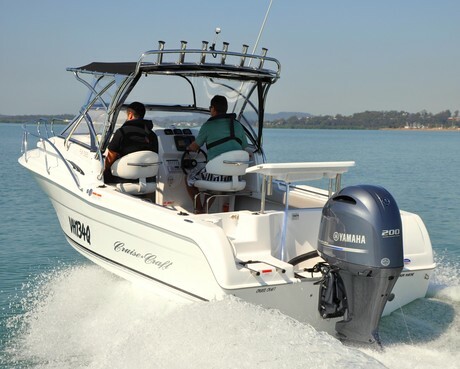 The new F200F and F200G outboards, both of which will be covered by a four-year factory warranty (for recreational use), will be available through Yamaha’s nationwide network of authorised dealers.